Damian Lillard puts up 26 points and grabs seven rebounds to lead the Trail Blazers in a 132-119 win over the Pelicans. 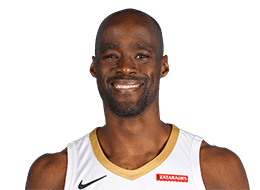 Emeka Okafor is back in the League after more than 4 seasons out due to injury. Sekou Smith spent time with Okafor and his family and found out how his incredible outlook and optimism kept his dreams to return to the League alive. Anthony Davis scores 33 points and Nikola Mirotic adds 31 as they lead the Pelicans to a victory over the Suns 122-103. Jrue Holiday Drive down the middle and dishes the pass to Emeka Okafor who throws it down with the two-hand jam. Russell Westbrook scored a triple-double while Paul George added 27 points as the Thunder beat the Pelicans 109-104. Damian Lillard goes off for 41 points and grabs nine rebounds to help the Blazers top the Pelicans 107-103. Anthony Davis comes up big in the first quarter and racks up a double-double with 28 points and 13 rebounds to put the Pelicans on top of the Pacers 96-92. Anthony Davis goes off for 37 points and eight rebounds to propel the Pelicans past the Mavericks 115-105. The Pelicans sweep the season series against the Celtics after Anthony Davis goes off for 34 points and 11 rebounds. Anthony Davis scores 31 points with 14 rebounds and Jrue Holiday adds 25, as the Pelicans win over the Hornets, 119-115. Ricky Rubio was dangerous for the Jazz with 30 points, 10 rebounds, and 7 assists in the 116-99 win over the Pelicans. Now Orleans's Anthony Davis had 25 points, 11 rebounds, and 10 blocks for a triple-double. Check out the best denials and rejections in the top 10 blocks of the week. Good passing by the Pelicans leads to the Emeka Okafor two-handed jam. Anthony Davis leads the Pelicans to their ninth straight win after posting a double-double with 41 points and 13 rebounds against the Clippers. Emeka Okafor gets the block on Sindarious Thornwell in the paint. Anthony Davis' double-double with 26 points and 15 rebounds leads all scorers as the Pelicans get the 121-116 win over the Spurs. Anthony Davis scores a season-high 53 points as the Pelicans defeat the Suns, 125-116. Jrue Holiday goes off for 36 points and nine rebounds in the Pelicans close 123-121 overtime win over the Bucks.